Whether you are looking to join a club or already are a member, TBPL has something for you! You're invited to join one of our book clubs! Upcoming sessions start at 7 o'clock and are held in the Community Room. Tea, coffee and snacks are provided. Second Tuesdays of the month at Noon. Bring your lunch and join in this noon-hour book club. Contact Donna at danuta@tbaytel.net for more information. Coffee, tea and snacks provided. Gather with other book lovers to discuss great books. It's free to join and the books are provided. Please call Vania at 345-8275 or wavbookclub@tbpl.ca if you would like to join. Are you an adult who likes to read graphic novels? This group is for you! Members will meet one Wednesday a month to discuss graphic novels based on a chosen theme. Refreshments are provided. Contact Meaghan at 684-6814 for more information. Calling all Book Clubs! Do you belong to a book club? If so, your library wants to hear from you! We have created a directory of local book clubs which is used to keep you informed of future author visits and new library services that may be of interest to your group. Call Helen at Mary J.L. Black Branch Library 345-8275 ext. 7300 or email hcimone@tbpl.ca. Need some ideas for new book club books? Each bag contains ten paperback copies of one title, discussion questions, author information, and reviews, for use by book clubs. Click through here to use KitKeeper, our new site that lets your manage your own Book Club in a Bag bookings! KitKeeper will show you which Book Clubs in a Bag are available on any given date, and will also allow you to manage your own bookings. Watch this video about KitKeeper for an overview of how it works. Click through here for a printable list of all the Book Clubs in a Bag titles (pdf). What is a Book Club in a Bag? A Book Club in a Bag is a kit containing 10 copies of one title for use by book clubs and book discussion groups. When you pick up a kit, you will also be given a discussion guide with a plot summary, author information and questions to stimulate discussion. Who can borrow a Book Club in a Bag? Book Club kits can be borrowed by any book club. Members of the club with a valid Thunder Bay Public Library card can check out a Book Club in a Bag for distribution to club members. Can a Book Club in a Bag set be reserved in advance? Yes. By using KitKeeper you can reserve Book Bag kits for your club up to a year in advance. Where can Book Club in a Bag kits be picked up? 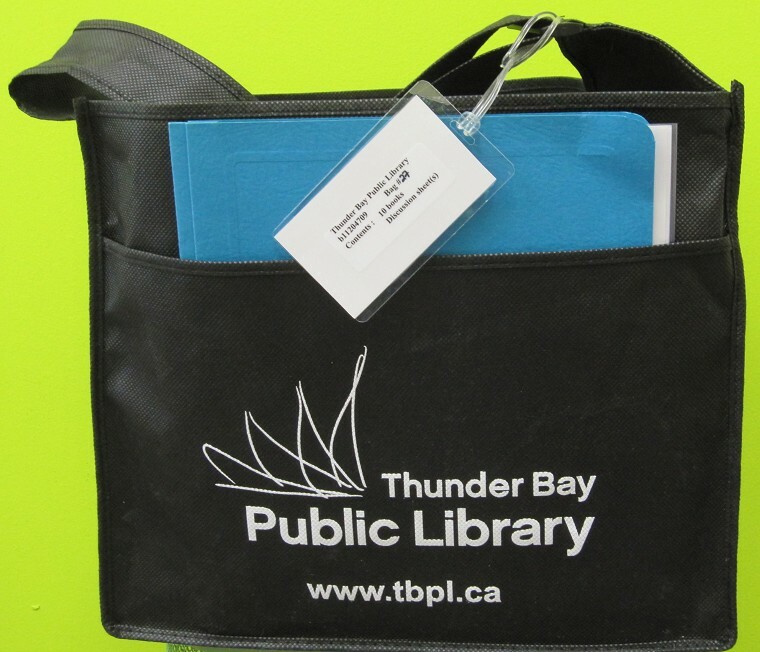 Book Club in a Bag kits can be picked up at any of the 4 branches of the Thunder Bay Public Library. When you reserve a Book Club kit using KitKeeper, you will be able to choose the library branch you wish to pick the kit up at. Where can Book Club in a Bag kits be returned? Kits can be returned to any of the Thunder Bay Public Library locations. Who is responsible for returning Book Club in a Bag Kits? The person who borrows the kit is responsible for returning it to the Library. How long can book clubs keep a Book Club in a Bag kit? Book Club kits have a 6-week loan period. Can Book Club in a Bag kits be renewed? No. Book Club kits are not renewable. Are there fines on Book Club in a Bag kits? Yes. Overdue fines for Book Club kits are the same as for other library materials. It is important to return all 10 books in the Book Club kit on time as other book clubs may have reserved the kit. Do you enjoy reading but find that you just don’t have the time? Are you running out of authors to read and want to discover some new ones? Do you ever dream of being able to sample your books before you commit to borrowing or purchasing them? If you have responded Yes to any of these questions, then you’ll want to check out our new service. It’s called an "online book club". Here’s how it works. Each day, Monday through Friday, the subscribers are emailed a portion of a book that takes about 5 minutes to read. By the end of the week, subscribers have read two to three chapters from the book and if they like it, they can check it out of the library or fill out a suggestion card if you think the book is good and the library should have it. New books are featured every week. There is no charge for this service! and a special sneak preview Pre Pub Club that lets you start reading books that aren’t even published yet. Click on the logo to join!! © 2003 - 2019 Thunder Bay Public Library, All rights reserved.